So I was reading over the transcript of what Kyle Busch had to say Friday at Auto Club Speedway and it's clear he is still mad over his run-in with David Reutimann last weekend at Sunday. But one answer struck me as particularly self-serving. When asked if he would like to see a change to the "have at it, boys" philosophy from NASCAR, Busch said, "I think in the instance in which everybody knew payback was coming, I think that's kind of dumb to let it happen." 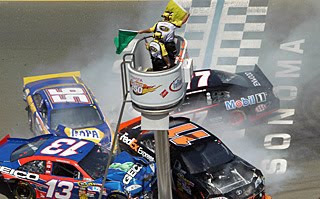 You mean at Atlanta when everyone knew what Carl Edwards was doing, getting in a wrecked car dozens of laps down to get back out and mess with Brad Keselowski? Or when Kyle Busch himself got pushed aside by Keselowski in the Nationwide race in August at Bristol, Tenn., and he returned the favor by punting Keselowski to help gain the win. Who didn't see those coming? Has Busch been paying attention all season? He may want to review his own laundry list of actions before he begins calling on NASCAR changes to how it polices driver conduct on the track.